The Clan!Destino? brewery was born in 2008 under the initiative of Luca Garberoglio who decided to follow on his own way the family’s path of good drinking. If his parents had dedicated a lifetime on a consolidated enological tradition at one of the wine territories of excellence in Italy, as it is the territory around the city of Asti, Luca, in that same territory has decided to row against the stream hitting the original road of the beer. It is born there the puzzle of words with the name Clan!Destino? : the union of the safety of the clan, of the family and tradition and the doubt of the destiny, of what the future saves for this experiment. Clan!Destino is now an assurance, so Luca decided to remove the interrogation mark from its name. Up to 2016, Luca has used for his beer the Weyermann’s malt, and third part facilities to brew it. But Luca’s family agricultural tradition has driven him to grow his own raw material. And that is how from 2017 the malt made from barley grown in Carussin will start to be used: 3 and a half hectares of two-row barley were grown on an approximate high of 300m over sea level to obtain a malt of great quality. The first bottles will be available in the end of 2017. General Description: it is a craft beer of top fermentation, not pasteurized, unfiltered and with second fermentation in the bottle, in bottles of 33cL, 75cL or in 15L barrels, it is made with a recipe of two light malts and four hops, of which one is added cold (dry hopping). Aspects: It has white, compact, homogeneous and very persistentfoam with good adherence to the glass. It has strong orange-yellow color, with light shades, that could turn into opaque and veiled at the end of the bottle or barrel, as the beer doesn’t go through filtration and has second fermentation in its recipient. It could be noticed a fine light perlage that persists after a few minutes. Smell: Its perfume translates the heavy usage of hops giving the beer herb and vegetal scents, that take over the malt, responsible for the sweet notes (yellow apple and honey). All these aromas combine with the yeast that is notable by it scent of bread crust. Taste: Its beginning is dry, carbonization is felt immediately giving part of the beers freshness. The initial sweet notes (acacia honey) is quickly overcame by the bitterness that from the back of the mouth suddenly takes the whole mouth. Its thin body and the persistence of herb and citric notes (because of the hops used) give it great drinkability. Recommended pairing: the bitterness and the freshness of this beer make it ideal to clear the mouth from fried food, such as tempura, besides its lightness that makes it a good pair for vegetarian food and raw vegetables, its low alcohol content (5º) makes it very thirst quenching and light, even for a snack in the middle of the afternoon; it could then be simply referred to as a beer to quench your thirst. 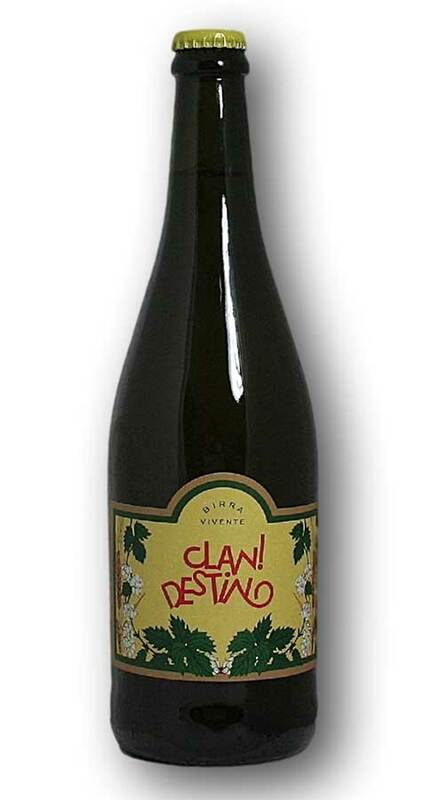 Versions: Clan!Destino beer is sold either in 33 cL bottles, 75cL bottles or 15L barrels.